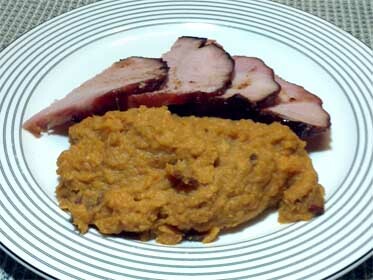 Cap'n Rons: Recipe for Bacon Mashed Sweet Potatoes. 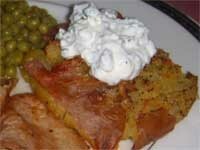 Welcome to Cap'n Ron's Bacon Mashed Sweet Potatoes Recipe. 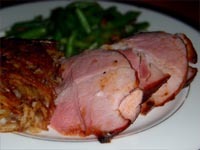 An easy and super side dish to serve along side a Baked Ham, Chicken or Turkey. Not too sweet so the sugar doesn't overpower the flavor of the potatoes. If you're even a little like I used to be, you think of Sweet Potatoes, covered in Marshmallows, and overly sweet. You'll be totally surprised in how good, and easy these are without the tons of sugar that is usually added to this naturally sweet tuber. As a kid, I never liked sweet potatoes. I guess it was because I always tasted them as an overly sweet concoction with more sweetness involving marshmallows on top. Just too sticky sweet for my taste. I say kid, but that feeling persisted for a REAL long part of my life. Fast for, a little over 20 years (I hate to admit the real number), and a boat neighbor, who didn't cook, said that he'd buy, if I cooked Sunday Dinner. Off we went to the grocery store with me trying to find out what he might want to eat. Well Gene finally came out with Sirloin Steak, and Twice Baked Sweet Potatoes. Now I had a dilemma, Gene being a good neighbor, and a nice guy, to boot. Do I tell him I don't like Sweet Potatoes, and have never cooked them? Or do I punt, and use my knowledge to make him something he'll enjoy. I opted for the latter? So, I used a twice baked method I would use for regular potatoes, and, after tasting their sweetness, I added the small amount of Dark Brown Sugar, Cinnamon, and nutmeg as shown above. AS we sat in the cockpit of my boat, I watched apprehensively as he went straight to the sweet potato first. I held my breath, then he pronounced it the best Sweet Potato he'd ever had. What a relief. 1. 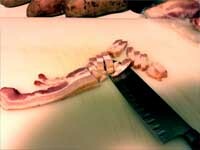 Slice the bacon crosswise into 1/4" pieces. 2. 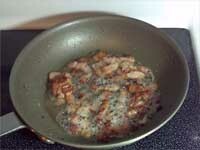 Fry over med /high heat until the fat is rendered and the bacon is almost crisp. Leave the bacon in the pan, and set it aside while you boil the sweet potatoes. 3. 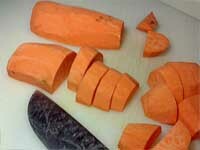 Peal the sweet potatoes, then cut into chunks. Bring to a boil, then turn to for a soft boil for about 30 minutes, or until you can easily insert a knife into each piece. 4. Drain the potatoes, mash, then add the butter, seasonings, and mashed until the butter is melted, and the seasonings are combined. Add the Bacon along with the Bacon Fat, and stir it in. If the bacon has gotten cold, just warm it up until the bacon fat has melted. 5. 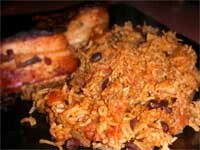 I served this along with my New Years Day Ham, a Root Beer Smoked Ham. The Pumpkin Pie flavors of my Jamaican Jerk Seasoning Blends really kick up the flavor of ingredients like Sweet Potatoes or Pumkin. I doubt you'll have any leftovers of this Sweet Potato Recipe. 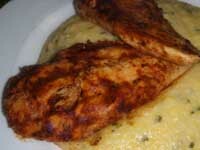 But, if you do, place them in a pot with a little milk, and re-heat over a low heat until they're warm.